CapTel 2400i - Weitbrecht Communications, Inc. The CapTel 2400i allows you to listen while reading captions of what’s said over the phone. It connects to your telephone service like a traditional phone and requires high-speed Internet. The captions are provided by a free service that uses the Internet connection to automatically display captions for every call, quickly and accurately. The CapTel 2400i is an ideal choice for individuals who prefer a more contemporary design and touch-screen technology. It features a large easy-touch display with multiple font sizes and colors for easy reading. The CapTel 2400i can be positioned anywhere within your wireless network range or it can be connected to your Internet with an Ethernet cable. Installation assistance is available. Bluetooth?¬´ word mark and logos are registered trademarks owned by the Bluetooth SIG, Inc.
FEDERAL LAW PROHIBITS ANYONE BUT REGISTERED USERS WITH HEARING LOSS FROM USING INTERNET PROTOCOL (IP) CAPTIONED TELEPHONES WITH THE CAPTIONS TURNED ON. 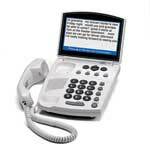 IP Captioned Telephone Service may use a live operator. 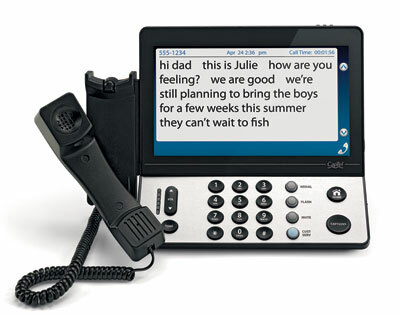 The operator generates captions of what the other party to the call says. These captions are then sent to your phone. There is a cost for each minute of captions generated, paid from a federally administered fund. To learn more, visit fcc.gov. Copyright © 2018 Hamilton Relay. Hamilton is a registered trademark of Nedelco, Inc. d/b/a Hamilton Telecommunications. CapTel is a registered trademark of Ultratec, Inc.